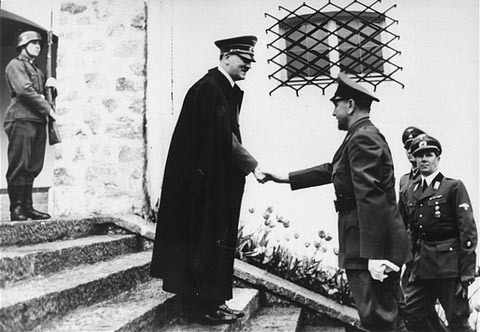 Hitler greets Ante Pavelic, leader of the Croatian Ustashi, June 9, 1941..........In the hierarchy of Hell that created the Holocaust, one group of killers stands out as more vicious, murderous, and bloodcurdling than all others. Who were they? Where did they plow their killing fields? How and why did they come together to sear a chronicle of atrocities a magnitude worse than Auschwitz? The answer: None were more savage than the Ustasha of Yugoslavia, a Muslim-Catholic alliance of Nazi killers so gruesome and beastly that even Berlin shrank in horror at the slaughter. This berserk army of ghastly murderers, the Ustasha, and three related crack divisions of Arab-Nazi Waffen SS comprised of tens of thousands of Muslim volunteers, terrorized people of all faiths in Yugoslavia. In large measure, these murder machines emerged through the efforts of the Grand Mufti of Jerusalem, Hajj Amin al-Husseini. The Grand Mufti was on a mission to accelerate the extermination of all Jews everywhere. His partner was Adolf Hitler — personally.NDH President Pavelic declared early on, "This is now the Ustasha and Independent State of Croatia. It must be cleansed of all Serbs and Jews. There is no room for any of them here. Not a stone upon a stone will remain of what once belonged to them." He later assured, "The Jews will be liquidated within a very short time." To this end, more than 20 Ustasha concentration camps were established for the killing process, manned by combined Catholic and Muslim forces. The most notorious of these camps was the hellish complex known as Jasenovac, considered by many to be more sadistic than Auschwitz by an immeasurable magnitude. Gas chambers were not needed. All death was personally inflicted.Mass throat-slittings at great velocity were achieved with a small hand blade wrapped tight to the wrist and dubbed the "Serbcutter." They were specially designed and manufactured for the purpose. One night, guards at Jasenovac wagered amongst themselves to see who could cut the most throats with their Serbcutters. Guard Petar Brzica, a Franciscan priest, was determined to prove his skill, which he did by slicing the throats of an estimated 1,360 defenseless inmates. Guard Ante Zrinusic lost the bet by only cutting the throats of about 600 helpless prisoners. Guard Mile Friganovi was close behind the winner, murdering only about 1,100 Serbs that night. NDH president Pavelic himself once showed a journalist a wicker basket filled with some 40 pounds of eyeballs. Pavelic joked that he could make an oyster stew with them.Women were carted away and raped endlessly until their captors were finished — at which time they were horribly mutilated for souvenir body parts. "A good Ustasha," Pavelic told his troops, "is he who can use his knife to cut a child from the womb of its mother. "Cruel and inhumane as the Nazis were, they retreated in wide-eyed astonishment when they learned of the joint Catholic-Muslim Ustasha atrocities. German General Edmund Glaise von Horstenau, the commanding officer of the region headquartered in Zagreb, reported back to Berlin, "According to reliable reports from countless German military and civil observers during the last few weeks, the Ustasha have gone raging mad." He added, "The Ustasha camps ... are the 'epitome of horror!'" In revulsion, Glaise von Horstenau wrote, "The most wicked [concentration camp] of all must be Jasenovac, where no ordinary mortal is allowed to peer in." Hermann Naubacher, Hitler's personal assistant for the Balkans, called the Ustasha exterminations "a crusade that belongs among the most brutal mass-murder undertakings in the entire history of the world." Naubacher somberly added, "According to the reports that have reached me, my estimate is that the number of those defenseless slaughtered is some three-quarters of a million. "Serbia was a staunch ally of the west in both World Wars. http://www.b92.net/eng/news/society-article.php?yyyy=2008&mm=12&dd=03&nav_id=55485 Grand Mufti Haj Amin al-Husseini reviews Bosnian Nazi SS volunteers during the Second World War............TODAY’S INDEPENDENT STATE OF CROATIA IS THE COPY OF THE NAZI PUPPET STATE OF SOME FIFTY YEARS AGO. THE COUNTRY HAS THE SAME: NAME, FLAG, NATIONAL EMBLEM, NATIONAL ANTHEM, CURRENCY, UNIFORMS (BLACK SHIRTS).... In 1990, the World Bank/IMF program began, and the Yugoslav state’s expenditures went towards debt repayment. As a result, social programs were dismantled, the currency devalued, wages frozen, and prices rose. The “reforms fueled secessionist tendencies that fed on economic factors as well as ethnic divisions, virtually ensuring the de facto secession of the republic,” leading to Croatia and Slovenia’s succession in 1991. Beginning in 1990 Germany and the United States sought and achieved the breakup of Yugoslavia in two stages—1992-1995 and 1998-1999. The German government aimed at this division because it wanted to include as territory of its “vital interest” Slovenia and Croatia, the most economically developed states of the Yugoslavian confederation. These states were old allies in the Second World War (the Ustashi fascist group in Croatia and the nationalists in Slovenia). Through them Germany would achieve access to the Adriatic Sea. Following Franjo Tudjman's and the rightist Democratic Union's decisive victory in Croatia in May 1990, German Foreign Minister Hans-Dietrich Genscher, in almost daily contact with his counterpart in Zagreb, gave his go-ahead for Croatian secession. Germany did not passively support secession; it "forced the pace of international diplomacy" and pressured its Western allies to recognize Slovenia and Croatia. Germany sought a free hand among its allies "to pursue economic dominance in the whole of Mittel Europa." Meanwhile, Germany shipped arms to Slovenia, Croatia, Bosnia and Herzegovina, and also trained “revolutionary corps” in special German camps to be sent into the states at the proper time to face federal forces. In the meantime, Croatian and Slovenian fascist associations in the U.S., Germany and Austria solicited money and arms, which they sent to the northern Yugoslavian states.According to the New York Times, Tudjman's HDZ party was heavily financed by members of the Croatian diaspora, especially by remnants of the Ustasa movement in the United States, Canada and Australia. In March of 1991, fascist organizations in Croatia demonstrated, calling for the overthrow of the Yugoslav government and the expulsion of all Serbs from Croatia. On March 5, 1991, they attacked the federal army base at Gospic. Thus, civil war began.Franjo Tudjman was a monster, but he was our/not mine! !/ monster.Fascism became "in vogue" in Tudjman’s Croatia. On Zagreb's streets, and in cities and towns throughout the republic, newsstands freely hawked Ustasha paraphernalia -- swastikas, the Fascist coat-of-arms, pictures of Ante Pavelic and other trinkets were sold openly.Much of Tudjman's financial backing was provided by Ustashe émigrés and several Ustashe war criminals were invited to attend the first convention of Tudjman's political party, the Croatian Democratic Union. Tudjman constantly harped on nationalist themes, saying at one point, "Thank God, my wife is neither a Serb nor a Jew. "Tudjman presented a medal to a former Ustashe commander living in Argentina, Ivo Rojnica. After Rojnica was quoted as saying, "Everything I did in 1941 I would do again," international pressure prevented Tudjman from appointing him to the post of ambassador to Argentina. When former Ustashe official Vinko Nikolic returned to Croatia, Tudjman appointed him to a seat in parliament. Upon former Ustashe officer Mate Sarlija's return to Croatia, he was personally welcomed at the airport by Defense Minister Gojko Susak, and subsequently given the post of general in the Croatian Army. On November 4, 1996, thirteen former Ustashe officers were presented with medals and ranks in the Croatian Army. The Krajina Serb population was resisting the rule of a Croatian regime that was clearly fascist. The war in Croatia was not the result of some “joint criminal enterprise,” or conspiracy, to create “greater Serbia.” The war in Croatia occurred because the Serbian population refused to be dictated to by a fascist regime in Zagreb.On August 3, 1995, Croat forces supported by the U.S. and headed by an American general launched a decisive attack in Krajina, expelling 300,000 Serbs, killing 14,000 people, and burning tens of thousands of Serbian homes as well as Orthodox churches and monasteries.It was the greatest GENOCIDE/ethnic cleansing in Europe since WWII.According to Croatian Foreign Minister Mate Granic, American officials gave advice on the conduct of the operation, and European and military experts and humanitarian aid workers reported shipments of U.S weapons to Croatia over the two months preceding the invasion.Major Western media mercilessly repeated daily anti-Serbian mantra. For years. Many years. The lies were racist and blunt. The Serbs were painted as mindless people who do evil for evil's sake. The message was clear: "These are no humans. Only beasts can do evil without cause." The magazine “Globus” reported that “Mein Kampf” is selling like hotcakes in all segments of Croatian society.Singing infamous Jasenovac i Gradiska Stara song which glorifies Ustashe and their genocide over Serbs, Jews, and Gypsies is popular even among schoolchildren and treated more like as yelling or screaming in public. It is a disgrace to the civilized world that fascism was allowed to emerge in Europe for a second time. http://www.globalresearch.ca/articles/CHO202G.html Croatian Ustashe liquidate Serb prisoner with ax..
Jasenovac concentration camp - Independent State of Croatia WWII .......Over 60000 fans celebrating Croatia's Nazi past with a Hitler style hand salutes - "Sieg Heils".....http://www.youtube.com/watch? In protests, supporters of Ante Gotovina and other suspected war criminals often carry nationalist symbols and pictures of Ante Pavelic. Among children, black Ustaše uniforms are now more commonly seen in Croatia than are those of the Young Pioneers. Public appearance of the Ustashe veterans seen in Zadar are tepidly condemned by some newspapers. Singing infamous Jasenovac i Gradiska Stara song which glorifies Ustashe and their genocide over Serbs, Jews, and Gypsies is popular even among schoolchildren and treated more like as yelling or screaming in public.http://www.youtube.com/watch?v=w6ph8Xhy7Z4&feature=player_embedded#! ........Many children in Croatia are raised in Ustashe tradition. .